Bring a large pot of salted water to boil. Add asparagus to boiling water and cook for 3-4 minutes. While asparagus is cooking, make the gremolata by combining the basil, parsley, lemon zest, and garlic in a small bowl. Set aside. Drain asparagus and rinse with cold water to stop the cooking process. Pat dry with a paper towel. 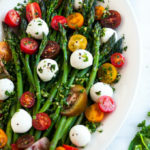 Place asparagus on platter and top with tomatoes and mozzarella balls. Drizzle with olive oil and lemon juice and sprinkle gremolata mixture on top. Sprinkle a little salt and black pepper to taste. Serve with asparagus warmed or chilled.